Instead of buying more, I’ve been experimenting with learning to make your own homemade cereal. Turns out, it’s much easier than you would imagine! 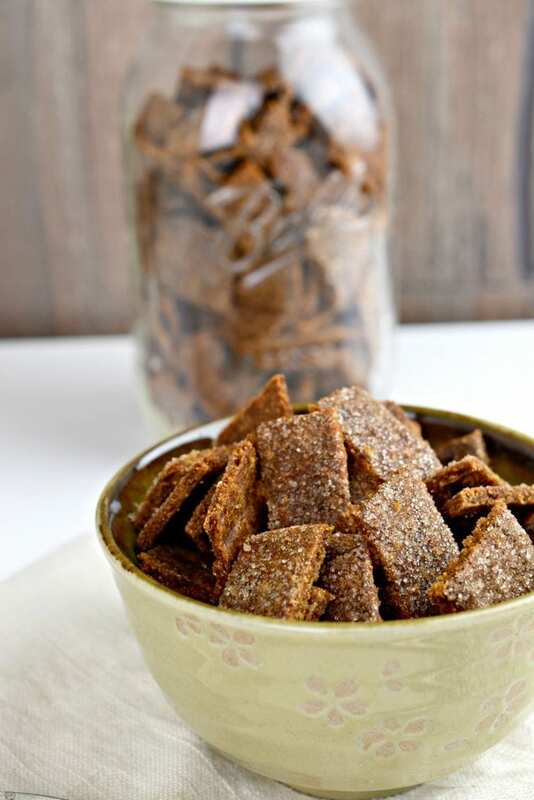 The homemade Cinnamon Toast Crunch like cereal I’m sharing with you today is so easy to make. 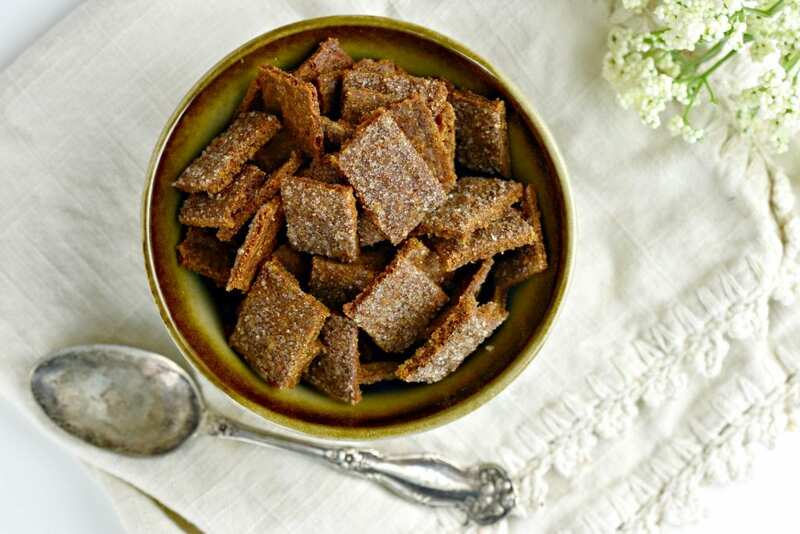 If you can make Homemade Crackers, you can easily make your own homemade cereal. Even if you aren’t a big fan of cereal for breakfast, this makes a great afternoon snack! In our home, breakfast really is the most important meal of the day. Ever since my babies were old enough to understand the concept of breakfast, I’ve tried to make it a delicious, but peaceful morning time that we spend together. I usually like to make a big breakfast…bacon or Homemade Sausage, pancakes with Blueberry Sauce, or a delicious quick bread like Banana Bread. I light a few Beeswax Candles, play some soft comforting music, and let everyone slowly wake up for the day. But some days, that just isn’t possible. We are in a hurry to get out the door for an appointment or on town day and we just don’t have time for an overdrawn breakfast. I’m no perfect mom, I feed my kids cereal on occasion for breakfast (although always with some kind of protein and fresh fruit otherwise it’s just not filling enough for my boys!) but I don’t always keep it on hand since it’s not a “regular” breakfast staple. 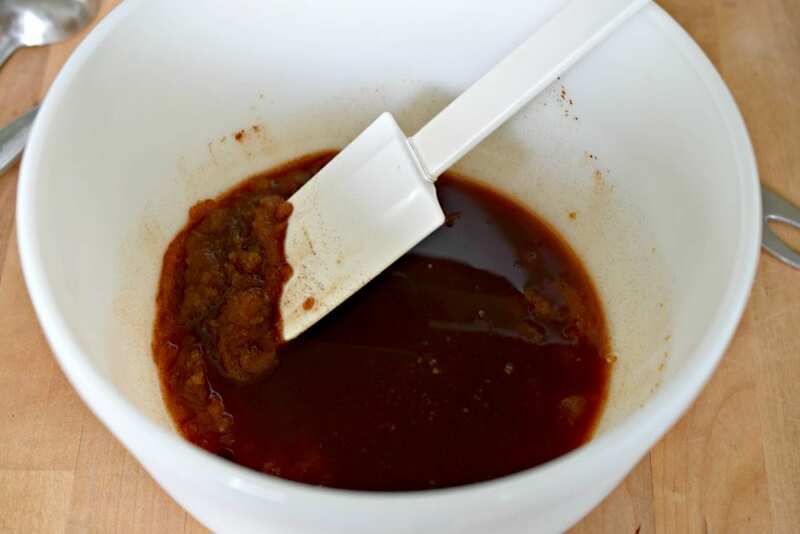 In a large bowl, combine the sugar, cinnamon, vanilla, honey, and melted coconut oil. For this recipe, I used a refined coconut oil instead of extra virgin so it would not have the coconut flavor. You can use whatever you have on hand. Add in the baking soda, 1 1/2 cups of the flour, and the water. Stir until combined, mixture will be messy. Add in the remaining 1/2 cup of flour. 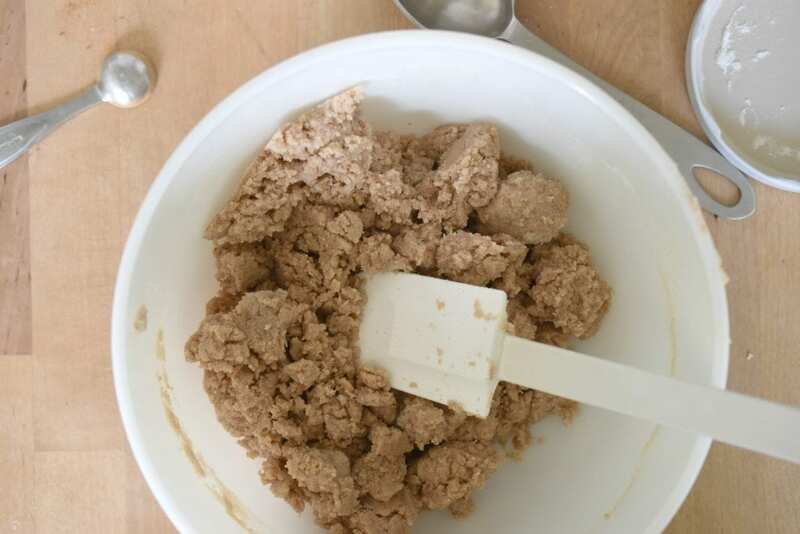 You want the mixture to be somewhat crumbly but not completely dry so if you need to add a bit less or a bit more flour, use this time to get the batter to the right consistency along with whatever flour you are using. 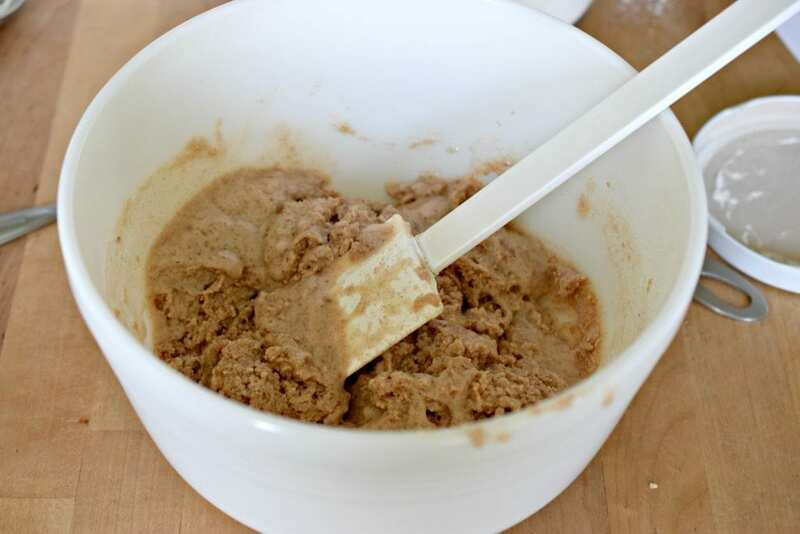 I’ve found that a total of 2 cups of my gluten free flour blend works perfectly with this recipe but depending on the blend you use, or if you decide to use all purpose or wheat flour, the amounts may be slightly different. 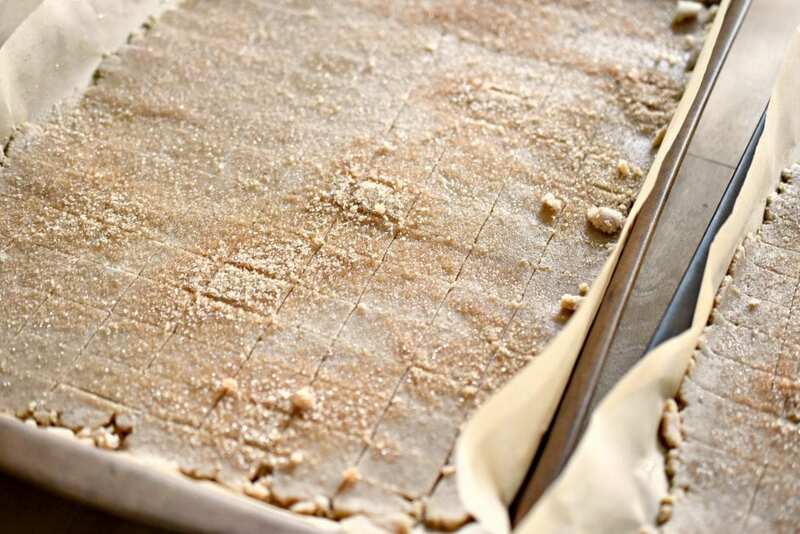 Place a piece of parchment paper onto two baking sheets or cookie sheets. Divide the batter in half between the two pans. 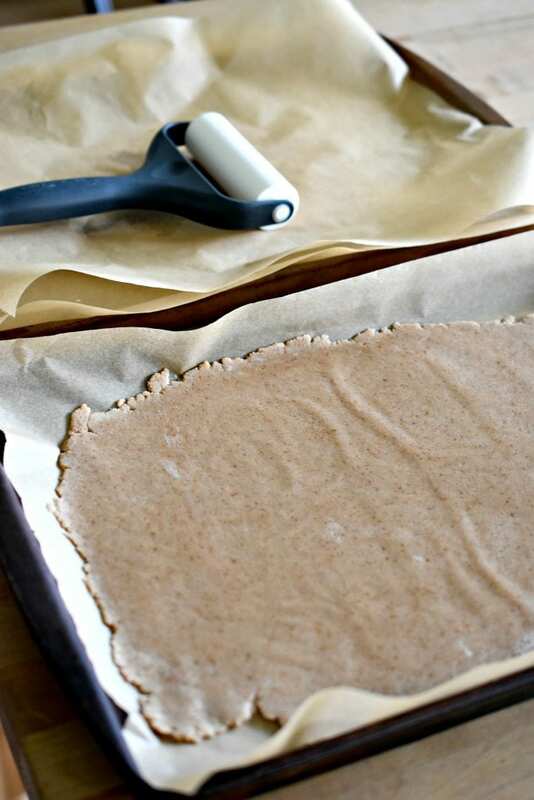 Spread it out a little with your fingers and then top with another piece of parchment paper and use a rolling pin to flatten the dough. Roll out to 1/8 inch thick. The thinner you get, the crunchier the cereal! 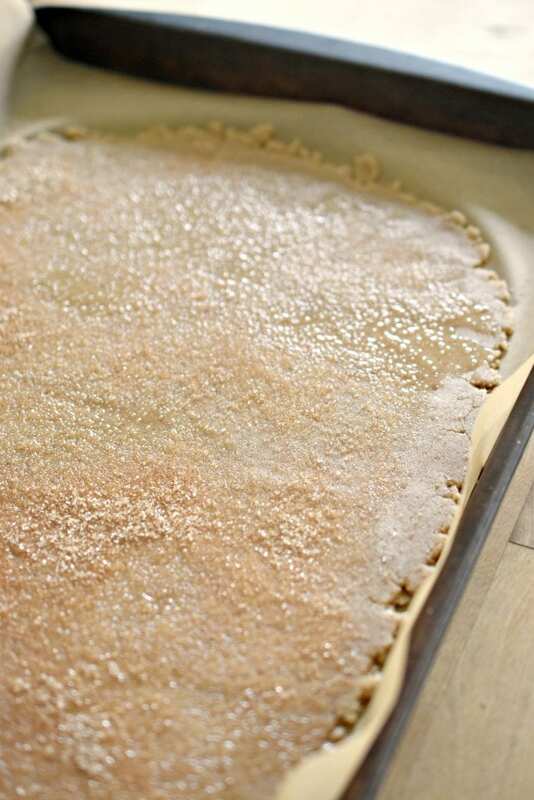 Melt another tablespoon or two of coconut oil and brush over the tops of the flattened dough. 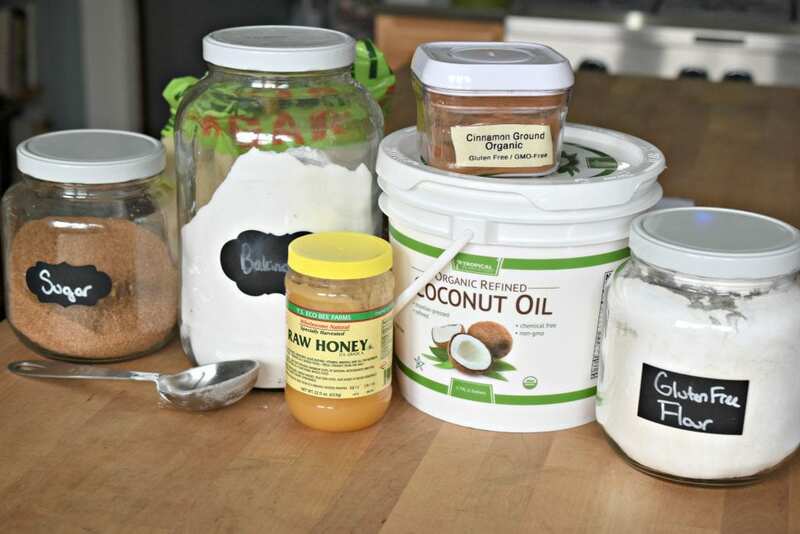 In a small bowl, combine 1/8 cup of cane sugar and 1/2 teaspoon cinnamon to sprinkle over the coconut oil. This step is optional…if you want to add as little sugar as possible, you can go ahead and skip this step! A layer of melted coconut oil will still add some nice flavor and crunch so I would still add that even if you don’t do the cinnamon/sugar mix. Use a pizza cutter or a small paring knife to score the cereal into small pieces. Bake the sheets at 375 degrees for about 15 minutes or until the cereal has turned a nice shade of brown. After you remove it from the oven, let it rest for a minute or two on the counter and then use your knife to score the pieces again, but only widthwise (or they will break). Let the pieces cool completely before scooping off the trays. This recipe will fill about 2 quart size jars or a half gallon jar. Store in the jar with a plastic lid on the countertop if you plan on eating soon or stick it in the fridge or the freezer for longer term storage. Enjoy for breakfast or as a snack. Not only is it tasty, but it will make your home smell delicious as it’s cooking. Win-win! Have you ever tried to make your own homemade cereal? Omigosh…. You always have the perfect posts for my family! I am so excited to try this out, it’s my family’s favorite cereal. We usually do big breakfasts, but my kids love to snack on cinnamon toast crunch. The store bought isn’t so healthy… Which is one more reason it’s best to keep my husband out of the grocery stores. He loves this stuff too! And with the weather cooling down and harvests put away, it’s back to baking! Do you think this would work with spelt flour? And, if so, should I add any tweeks to the recipe? We also do a granola recipe…. Omigosh…. 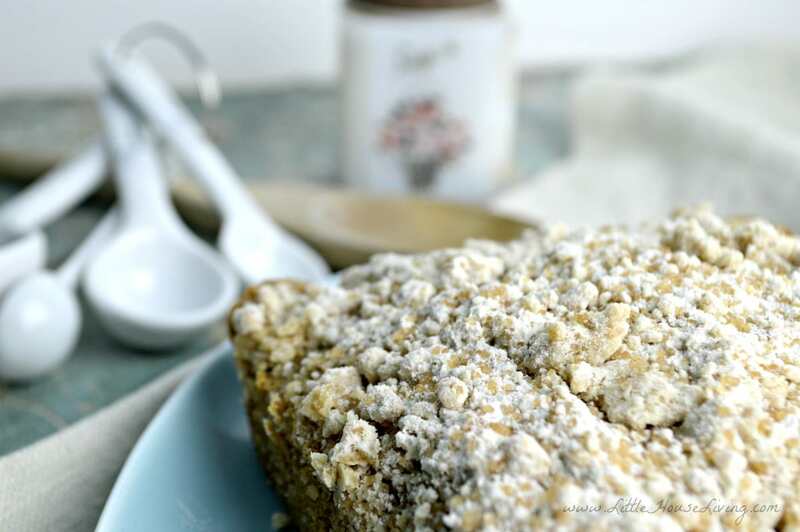 Don’t know how healthy it is after we add honey, chocolate chips, and toasted coconut… But it’s organic! Lol!it makes the house smell good though! First of all…I LOVE your blog, Instagram and website! 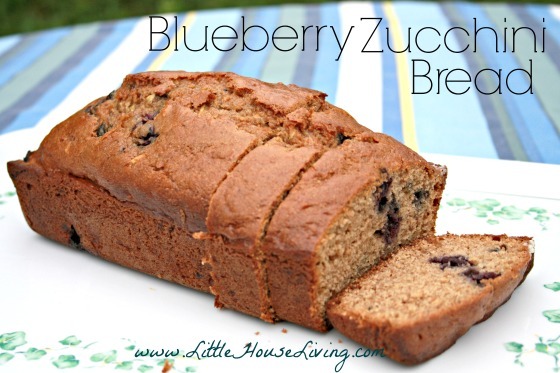 I tried these today…followed your recipe with gluten free flour and they turned out great! What an easy snack or breakfast. Mine did brown quickly so next time I’ll bake at 350. Thank you for all the inspiration you bring me! This looks awesome! I’ll definitely be trying these. With 4 little ones I’m always looking for yummy “less-processed” food and snacks! I just have to tell you how much I appreciate your blog! I have used so many of your recipes, and you are an inspiration! Aw, thank you Julia! I hope you enjoy this recipe when you get a chance to make it. This was my kids’ favorite cereal…they are now 39, 37,and 35 !!! I plan on making some, though, because they are all trying to feed their families healthier. Thanks, and I’ll let you know the verdict ! Thank you! I really like this recipe and gluten free too. Healthy too! I will add fruit protein smoothie or a few nuts on the side to make sure protein happens at breakfast. This recipe sounds awesome! I am definitely making this today, but between the two of us (husband and me, no kids) there probably won’t be hardly any left over for breakfast. Guess I’d better plan on a double batch. Love your recipes! They are all so people friendly, as well as being healthy and delicious. By the way, I treasure your book. It is so chock full of delicious recipes, hints for meal planning, and instructions for storing a wealth of ready to make meals. It’s a lifesaver for busy families, as well as for people who are planning for natural disasters like hurricanes, storms, etc. where you may not have electricity for long periods of time. A simple thank you does not seem adequate, but it is all I have. So, Thank You! Aw thank you! A simple thank you really is enough, by the way, I love hearing when things I’ve written are useful. Yes, I would double this recipe if you want to make more than a day or two’s worth at a time. This sounds so delicious. Thank you for sharing. You have just made my day! This is my all time favorite cereal and I have missed it since I had to go gluten free. So excited to try this! Yum! This looks so amazing! We’ve started making more at home to avoid processed foods but never thought about cereal! Definitely trying this soon! Thanks for the inspiration! This is a great recipe that I can’t wait to try! Thanks so much for sharing your post with us at Full Plate Thursday! Have a great week and come back to see us real soon! That looks way more delicious than the store bought kind – thanks for sharing your recipe on this weeks Creative K Kids Tasty Tuesday! This looks delicious! Those are some of my family favorites, too. I love this! Never thought about making my own cereal (granola, yes, but cereal?) but it makes sense of course. 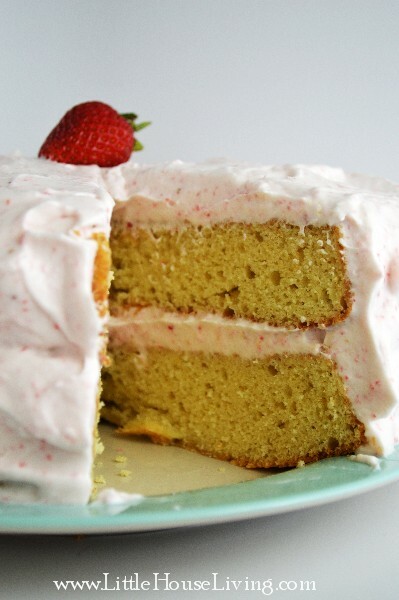 I’m featuring the recipe of at the Friday Favorites linky party. I am super impressed that you make your own cereal. Now that is a dedicated mama! For anyone wondering about substituting the coconut oil out (for those that can’t have it or just don’t have it and still want to make this), I tried one batch with vegetable oil and another with melted butter, both came out delicious. I didn’t get to try shortening as I was all out, but I suspect it would come out flakier. Perfect, thanks for sharing that substitution! No problem! I know a lot of times food bloggers get questions about substitutions, but they don’t usually get to test out a bunch themselves. 🙂 I’m excited that I can make it, as I can’t eat some of the fake sugars they use in the grocery store version (plus this is healthier, even with butter haha). I missed having it! Thanks so much again! I’ll be checking out more of your recipes for sure! How to make gluten free flour our own? Here’s my recipe — All Purpose Gluten Free Flour. I can’t wait to try this. It’s my husbands favorite cereal. Mine is Golden Grahams, I wonder how you would do that. I will have to experiment a little more! research-based goodies for living simply and frugally. I am in love. With the sights, the ideas, the recipes, the wisdom. So happy you are here, bringing light and offering alternatives. The people need you. The planet needs you.